A feature of some (typically rural) neighbourhoods is the shared well. A shared well is a well that provides water to more than one property, usually so that the costs of installation and maintenance can be shared. We are told that some feel having a regular flow of water that results from usage by more than one property (up to a certain point where too much water is being drained) can improve quality of the water being drawn. A shared well is a well typically located on one property, along with a submersible pump (unless the well is a flowing artesian well). One of the properties (typically the one where the well is located, but not always) is billed for the electricity to run that pump in the well. It is normally the responsibility of the property owner that has the well to maintain the pump. Neighbours who share access to the well are typically expected to equally share the costs of maintenance, repairs, and a contribution to the electricity costs. Once the water reaches each property, owners are often responsible for their own individual water treatment and pressure systems for each property. Well agreements are a common and important part of shared wells. This kind of agreement is mostly about common sense. These agreements would be similar in that regard to some other agreements, such as shared driveway agreements. We recommend that a formal agreement, registered at the Land Titles Office, is always a good idea with these types of arrangements. And like any agreement, it should be formalized before problems arise and while all parties are on good terms. What are the risks of not having a registered agreement for a shared well? The importance of a well agreement is primarily to secure a right of access for the neighbouring properties who do not have the well on their properties. Without a registered agreement, privity of contract would arguably be between original owners. How do owners of neighbouring properties, or future owners, prove legal access to the well on someone else’s property? Another example might be a neighbour who uses a lot of water for watering lawns, filling swimming pools, flooding backyard rinks, or filling cisterns to take to the cottage. Can a neighbor sell their water? When the cost of running the pump is shared by numerous neighbours, and one neighbour’s water use is exceptionally high, is that permitted and should everyone pay equal costs? (Typically costs are shared equally.) In the absence of an agreement, who decides what repairs are necessary and who will be hired to do the repairs? When a pump fails, sometimes decisions need to be made quickly and confidently and trades people want payment. When looking to buy a home, unless you are confident the property has municipal water, you need to ask or find out if it has a shared well. If the property is serviced by a shared well, we recommend that buyers should always alert their lawyer to that and consult a lawyer before entering into the Offer to Purchase, or at minimum make the offer subject to lawyer’s approval and then alert the lawyer to that issue. Again, lawyers should be made aware of shared wells or well agreements in order to properly advise their clients. The lawyer can do a title search (if the realtor has not already done so) to find out if a well agreement is registered against title. It is not sufficient to require a vendor to provide a well agreement (which may be an old simple agreement scratched out between former owners) – it should be a registered well agreement (registered at the land titles office) that has been reviewed by the buyer’s lawyer. The buyer will want to know whose property the well is on, if the agreement is registered with the Land Titles Office, and if so, what it says in terms of electricity and other costs. Remember, once the contract to purchase (the Offer to Purchase) has been completed, it is likely too late to properly address this issue! To use an example we see too often in our office, a buyer may find out that a property accesses water via a shared well, but excited about the new purchase and focused on the more interesting features of the home, eager to purchase and not wanting to add conditions, the buyer simply ensures the Offer to Purchase contains a term that says something like “Seller to provide a well agreement prior to possession”. The Offer to Purchase is signed, and the buyer’s conditions are removed. Close to the possession date, an old crumpled document from 1968 called “Well agreement” is handed to the buyer, and it is an agreement relating to the property, but possibly between different owners who were friends in 1968, possibly one paragraph long, not professionally prepared, and it was never registered on title. What now? This article won’t attempt to answer that question. We recommend that if a buyer becomes aware the property contains a shared well, in addition to ensuring there is an agreement registered on title, they also obtain a copy of the agreement and read it, or pay to have their lawyer review the contents of the agreement, and this is particularly important in older neighbourhoods. Well agreements may have been registered many years previously and sometimes no longer reflect what is happening on the properties. For example, perhaps when the area was being developed the first two neighbours entered into an agreement and registered that agreement. 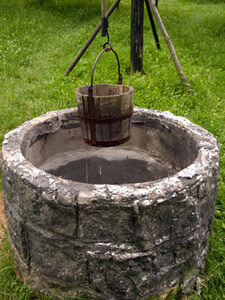 Since that time, perhaps other neighbours were allowed to “tap into” the well, perhaps a new well was dug years prior in an urgent situation, or perhaps larger properties were subdivided and as a result the caveat by which the well agreement was originally registered has carried over to the newly created titles but does not relate to the new titles. On a cursory review of those titles, there may be a registered well agreement, but without reviewing the contents of the agreement there is no way to tell if it properly addresses the current situation. When major disputes between neighbours ensue regarding their shared well, the homeowner with no well on his property and no agreement to turn to, is left with few choices. And without water, decisions need to be made quickly. One option may be to drill a new well if governmental authorities and conditions permit it. That cost could run several thousands of dollars. Litigation is sometimes an alternative, but the costs of that could easily surpass the option to drill a private well, there is always a risk of losing in litigation (especially in the absence of a good agreement), and the stress and time involved with legal processes should be considered. Informal agreements can also sometimes create problems when one homeowner decides to sell, or a buyer makes appropriate inquiries prior to entering the Offer to Purchase. Sometimes neighbouring homeowners do not wish to contribute to the cost of completing a new agreement and registering it, especially if things have been working fine for them and they see no need. It can be awkward for a new buyer to introduce themselves to a neighbour asking for a well agreement to be established and hoping costs of one to be shared. A registered well agreement should ideally include a reference to the location of the well (including whether it is on a boundary or the exact location on someone’s property.) It should indicate which properties are granted access to other properties including for maintenance required on the water lines. For example, if the well is shared between several properties in a row, the properties farther from the well will need the agreement to be registered against the additional properties that their water line passes through. The agreement should state which homeowner receives the electricity bill and how the costs will be shared, including when and how payments are made. It should specify who can decide when maintenance and repair may be necessary and how the costs of maintenance and repairs will be distributed. Having a well agreement does not guarantee quality, quantity, or potability of water. Well water should be routinely tested for potability. Pressure systems, softeners, and other treatment systems vary. Local plumbing companies are usually very familiar and capable of dealing with practical issues. For more information or questions about well agreements or a specific situation, please contact one of our lawyers. At Smith Neufeld Jodoin LLP we have experience with rural property transactions involving wells, and other issues common to rural properties. Outside of City of Winnipeg based firms, we are the largest law firm in Southeastern Manitoba.